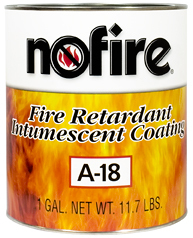 NoFire A-18 paint is the standard used for all land based civilian applications including residential, commercial and industrial uses. It is used in all NoFire Textile materials. NoFire A-18 is a classified product by Underwriters Laboratories. It complies with the Uniform Building Code requirements and exceeds standards for many commercial and industrial applications. A complete list of approvals including copies of test reports is available in the NoFire Technical Manual.